Volume 1: European Inspired Techniques: Shares their knowledge of these modern nymphing techniques from foundation and theory then progresses to execution of advanced techniques, determining best method. 83 min. In this instructional video, Devin Olsen and Lance Egan share their knowledge of these modern "European" nymphing techniques. After more than 20 collective years of representing Fly Fishing Team USA, Devin and Lance have acquired the skill and knowledge to medal repeatedly at the World Championships. Their combined resumes include World Championship team silver, team bronze, two individual bronzes, three National championships, three America Cup titles and numerous domestic competition medals. 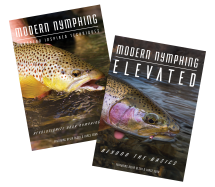 ABOUT THE AUTHORS Devin Olsen spent his first day with fly rod in hand in Yellowstone National Park at age 9. Fly Fishing soon became an addiction and he pursued it throughout his grade school years. In 2004 he was introduced to competitive fly angling at the Fly Fishing Masters tournament in Oregon. In 2006 he became a member of Fly Fishing Team USA and has been. He has had eight consecutive berths with his teammates in the FIPS Mouche World Fly Fishing championships. Lance Egan was born in Salt Lake City, Utah and currently resides in Lehi, Utah with his wife, Autumn, and their two children. Lance has had a passion for fishing since childhood and has made a career of fly-fishing. As a competitive angler, Lance has found much success.